The telmedx cloud-based telemedicine platform is designed to expand your visual reach to help manage healthcare remotely. No new software or hardware is needed, and the platform easily drops into daily routines and existing medical workflows. The telmedx platform delivers high-resolution live video and still photos that can easily be added to an ongoing call with a nurse or patient on a mobile phone. An app on a mobile phone connects to a Web browser through our cloud-based server. 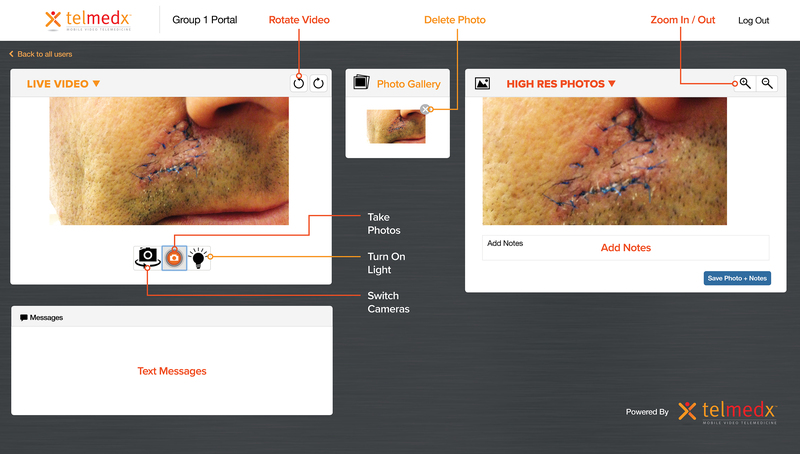 Multiple doctors in different locations can view the same video and take their own still photos for closer analysis and the photos can be saved into a medical file with a simple right-click. Live video and still photos are displayed side-by-side on a Web browser. No photos or videos are saved on the mobile device or on our server, making the platform HIPAA-compliant from end to end. The telmedx platform is designed transmit Bluetooth telemetry to add vital signs and other critical medical information to be displayed along with live video and still photos. The telmedx platform delivers high resolution video and photos, as well as 40% to 60% better audio than video chat and videoconferencing systems because we split the voice and video into separate channels on the mobile network. We do not digitize the audio to run it through the Internet as video chat systems ﻿do. The telmedx app is compatible with Apple® and Android® mobile phones and tablets.